George Studdy was born on the 23rd June 1878 to Ernest and Constance Studdy at the family home in Devonport, in the county of Devon, U.K. He was the second of their three children, the eldest being Ernestine and youngest Hubert. George’s father served as a lieutenant in the 32nd Regiment, Argyll and Sutherland Highlanders. His older sister Ernestine followed in her mother’s puritan ways. His younger brother Hubert, who had a passion for the traditions of the church, became a well-loved Minister. George hated church, and as an adult almost never attended a religious ceremony. In his formative years George identified very much with his father, and shared his love of outdoor activities such as hunting and shooting. They would regularly go on fishing trips together, a passion which George enjoyed for the rest of his life. Ernest Studdy hoped that one of his sons would follow him in a military career, and George started preparatory education at Clifton College, Bristol. Unfortunately, he suffered a foot injury from a pitchfork accident, which required specialist treatment only available in London. Between regular attendances at the hospital, George stayed with his aunt in Dulwich and gained admission to Dulwich College in order to continue his education. He left in the summer of 1896, but was still not fit enough to enter the army. He served a brief apprenticeship at the Thames Iron Works as an engineer, before joining a stockbroking firm. However after three years he left, and with a gift of £100 from his aunt, he attended evening classes at Heatherley’s Art School in London. He also spent one term at Calderon’s Animal School to study animal anatomy as well as drawing. Soon he was sharing a studio with friends from art school where he worked hard until he had sufficient material to fill a portfolio. He then managed to sell some drawings to a few publishers. A little later, he was commissioned by several newspapers and magazines to draw action scenes for articles on the Boer War. Having already been published in Boys Own in 1900, Comic Cuts was the first publication to regularly buy George’s work, and by 1902 he was contributing to Pick-Me-Up magazine and The Big Budget Comic. It was also about this time that he started his long relationship with Valentine’s Postcards of Dundee. Some of the first images they published were a series of six cards called "The Evolution of the Motor Car". 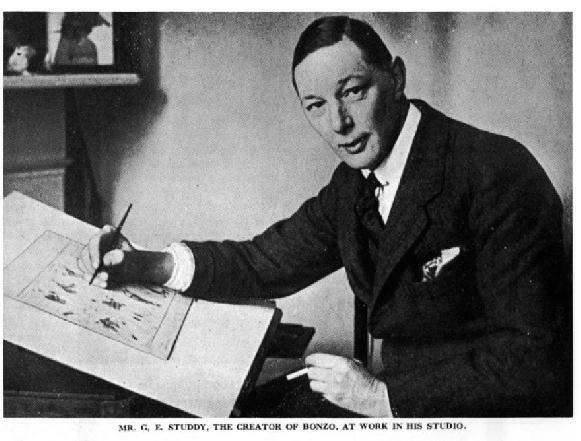 In 1905 Studdy joined the London Sketch Club, a membership he maintained throughout his life, where he met all the major illustrators of the day, and was elected President in 1921. He was also an active member of the Savage Club. By 1912 Studdy had an excellent reputation as an illustrator and cartoonist, with works appearing in The Graphic, both Printer's and Winter's Pie, The Bystander, The Tatler, and many others. The most notable was The Sketch, a weekly published by The Illustrated London News, producing a weekly full-page drawing. 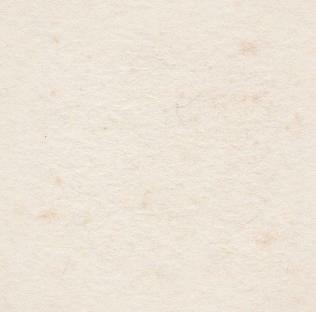 The odd dog had appeared in his drawings by now, but as yet nothing regular. He also held a tutoring position at Percy Bradshaw’s Press Art School in Forest Hill, London. On 15th June 1912 Studdy married his French sweetheart Blanche Ernestine Landrin at Our Lady of the Rosary, Marylebone, London. They had two children, a son, Vivian Holdsworth in 1916, who died when he was just a few weeks old, and a daughter, Vivienne Georgette born in 1918. When war broke out, he was again refused entry into the army due to his childhood injury. In addition to his graphic work, he was commissioned by Gaumont to make a series of three short cartoon films entitled ‘Studdy’s War Studies’, which were released monthly from December 1914. After the Armistice in 1918, George was busy drawing illustrations for many publications - such as various Children's Annuals - as well as still supplying The Sketch with weekly full-page illustrations. However, as the war had finished the magazine's editor felt that the subject matter should be somewhat lighter. In time, he expressed interest in ‘The Studdy Dog’- which George had developed over the past few years - suggesting they gave it a six month trial in the magazine. The first appearance was on 2nd November 1921. It proved a winner, with the character of the dog developing over time, moving away from more recognized breeds into a cartoon version. The pup’s antics capturing the interest of the readers, but it was still only known as the Studdy Dog. The editor, Bruce Ingram, received many letters complaining that as the dog had become the Nation’s pet, it was about time that his name be revealed. So on the 8th November 1922, it was announced that the little dog was called "Bonzo". It is interesting that it was Bruce Ingram who suggested the name, and not Studdy himself, who didn’t much care for it! The fame of Bonzo gave the Studdys a comfortable life, moving from their Chiswick home to a large first floor flat at 88 Philbeach Gardens, Kensington, London. Four years later they bought the freehold of number 75, and occupied the three lower floors. There were always dogs in their home. Studdy had a succession of cocker spaniels called Ben and Blanche a series of Pekinese named Chee Kee, which became Bonzo’s girlfriend in the cartoons. As their daughter Vivienne grew, so too did Bonzo. He continued in The Sketch, and in the early twenties they re-used many of the magazine images to produce four ‘Studdy Dog Portfolios’, each containing fifteen colour plates together with a specially designed title page and cover, at a cost of two shillings. At least three further portfolios were brought out in 1925, each with only eight plates but loosely mounted on 'Art brown mounts'. By now other publishers were fighting for a stake in Bonzo, and several including John Swains & Sons together with Partridge published little children’s books featuring his antics. He appeared in many advertisements, selling everything from tobacco, cars, soap, and polish to confectionery and pickles. He was also featured among the first neon signs put up in London’s Piccadilly Circus, when the area was developed to rival that in Times Square, New York in 1924. The postcard side also continued strongly, with George drawing up to 500 images for Valentine’s alone. Images of Bonzo appeared everywhere. There were glass perfume bottles and inkwells, china figures, jugs, ashtrays, plates, cups & saucers, condiment sets, soft toys and metalware, and at the top end of the range there were porcelain figures from both the Royal Doulton and Royal Worcester factories. Spears produced several games featuring the dog - including a variation on Snakes & Ladders called ‘The Bonzo Chase Game’, and jigsaw puzzles were made by A.V.N. Jones & Co. In October 1924 the Producer William A. Ward collaborated with George Studdy to produce the first of 26 films featuring Bonzo for New Era Films. These required hard work by George and ten other artists to create the thousands of drawings needed for each film. They ran for about ten minutes each, and were released throughout late 1924 and till the end of 1925. As an added honour for George, King George V and Queen Mary attended the premiere of the first film. It was the first time a reigning monarch had done so in a public cinema! Bonzo's populartiy was by now also growing in other countries. By the mid 1920's he had appeared in continental Europe - France, Germany & Austria, Denmark, Norway, and Czechoslovakia. At the same time, Bonzo had gone transatlantic, and was syndicated by King Features Inc., appearing in many US Sunday newspapers' suppliament "The American Weekly", and a new series of small hardback books published by McLoughlin Bros., Inc. in 1929. In 1927 Bonzo appeared in Toby Magazine, a monthly children's' magazine which featured him in a comic strip form. In July of that same year it was decided to give Bonzo a rest from The Sketch in case the readers were tiring of him. George agreed and replaced him with a series of cartoons featuring motoring subjects entitled "What we motorists all feel at times!" (which were also issued by Valentine’s Postcards). After these there was a gap of fifteen months before Studdy returned to The Sketch, but not with Bonzo! His new series was headed "Exit Bonzo - Enter Ooloo! The new load of mischief!" thus introducing the Studdy Cat. Apart from the very occasional ‘guest appearance’, Bonzo never appeared in The Sketch again. All was not over for Bonzo however, and just before the Second World War he appeared in the first of Dean’s books, including the first Annual in 1935 - titled ‘Bonzo’s Laughter Annual’. These annuals continued again after the war, and four were drawn by other artists and published after Studdy’s death. Despite worldwide fame, George remained a retiring, private person, avoiding personal publicity. He spent minimally on himself, but was hugely generous towards others, never bothering about financial security. He was a great supporter of charity work, generously helping many worthy causes, including St. Dunstan’s Hospital for First World War veterans, Doctor Barnardo’s Homes, and The Princess Beatrice Hospital in Earls Court. He also helped raise funds for fellow artist Louis Wain when he was committed to a mental asylum and had lost all his money. Both George and Blanche enjoyed the theatre. She was an active member of the local dramatic and opera society, and he would sit in on plays and musicals in London’s theatres, sketching caricatures of the actors to accompany first night reviews. George remained a passionate angler, something he’d picked up from fishing trips with his father. He was not keen on town life and liked to get away whenever he could to the solitude of a countryside river. George might have been a wealthy man but through bad investments and his unceasing generosity, together with a low income during the war years, he lost much of his financial security which meant that he had to keep working. He diversified to produce a series of postcards for Humoresque in a style similar to Douglas McGill. He didn’t think it fitting to sign these with his own name, and became ‘Cheero’ for a while. During World War II, Studdy moved out of London to Portsmouth to work as a draughtsman at the Royal Naval Dockyards, while his wife and daughter spent the war in the Lake District. Their London house was badly damaged during the bombing, but they returned there when it was rebuilt after the war. By 1947 the crisis had lessened and George resumed his illustrating work, but in September he began to suffer from severe chest pains. He was confirmed as suffering from cancer. Having been a heavy smoker for most of his life was certainly the main cause, but it was aggravated by the dusty atmosphere of wartime. He began to lose the use of his left arm in November that year, and within a few months he was confined to bed. George Studdy died on the 25th July 1948 and was cremated at Golders Green Cemetery in London. He didn’t leave much money or many possessions, but his legacy to the world in Bonzo is still very much with us and he continues to make us laugh and smile today. With grateful acknowledgement to Paul Babb & Gay Owen.